Queen Elizabeth national park is a fusion of all nature and cultural attractions of Uganda. It is the most preferred park of Uganda that offers the best wildlife and jungle experiences. During the safaris in and around this park, you will be exposed to a cross section of natural endowment representative of the entire country. The rift valley, volcanic features, the fertile soils that grow almost everything, the rich cultures, the equator crossing point, lakes and rivers are abundantly found in and around the national park. The location bellow the rugged Rwenzori block mountains give a backdrop scenery that is unique to this park. The park lays in the Albertine rift valley, which is home to both the lowest and highest points of Uganda (lake Albert and Rwenzori mountains), justifying the ecosystem richness that is found in this part of the country. During the safari, you will be able to discover the connection of queen Elizabeth national park to these two important habitats though the natural water catchments and wildlife corridors. The queen Elizabeth national park is home to a mixture of ecosystems ranging from the low land savannah to the rolling hills, wetlands, lakes and craters and the lowland tropical forests. The landscape is rewarding, with highlands, rift valley escarpments, volcanic features and the famous crater lake cluster with up to 52 lakes of the kind in one district, in Bunyaruguru offering some of the best scenery. The habitat diversity equally influences ecosystem richness. The jungles of the park are packed with plants and animal life, including the big five, birds, and aquatic life in the numerous lakes and wetlands including the crocodiles and the elusive shoebill stock, the chimps and other primates. The park also neighbors Bwindi impenetrable forest national park, a home to famous mountain gorillas in the south. Safaris and activities charged on standard price: Most people who visit queen Elizabeth national park take the standard and commonly sold activities. These include; a private safari in Kasenyi tracks or looking for tree climbing lions in Ishasha, Kazinga channel boat cruise from Mweya, experiential tourism activities such as mongoose tracking, lion tracking, hippo census or a safari on Mweya peninsular side. These activities will require payment of park entrance fees, activity fees, guide fees either covered within the activity fee or separately, private car with fuel and driver or related cost to pay for it collectively. They are charged at a standard price as reflected on the park tariff of the time. All payments for these are done at the park gate or visitor information center either directly or indirectly through the travel agent/ tour operator. Either not all people can’t afford the high costs and level of comfort or don’t like that level of monotony and want to do something differently by going off the beaten track, so we provide the optional ways to explore queen Elizabeth differently. If you have been looking how to get the best out of your trip to this park but didn’t know how yet, we have listed the effective tricks that you need to know about. Whether you want to meet the people, explore the nature and scenery or relax on the scenic points by the waters at the most affordable prices, this one is for you. Kazinga channel community cruise: This cruise starts from katunguru village. It is accessible by public transport, doesn’t require Payment of park fees, priced at 25$ per person. But guess what? It goes on the same Kazinga channel as the queen Elizabeth national park boat, giving the same wildlife viewing opportunities. Kikorongo boda-boda safari: The community youth at Kikorongo are offering an adventurous safari on boda-boda. Boda-boda is a local name for motorcycles tailored to offer public transport, used across east Africa, in town and villages. This safari takes through the villages on the routes that go through queen Elizabeth national park. 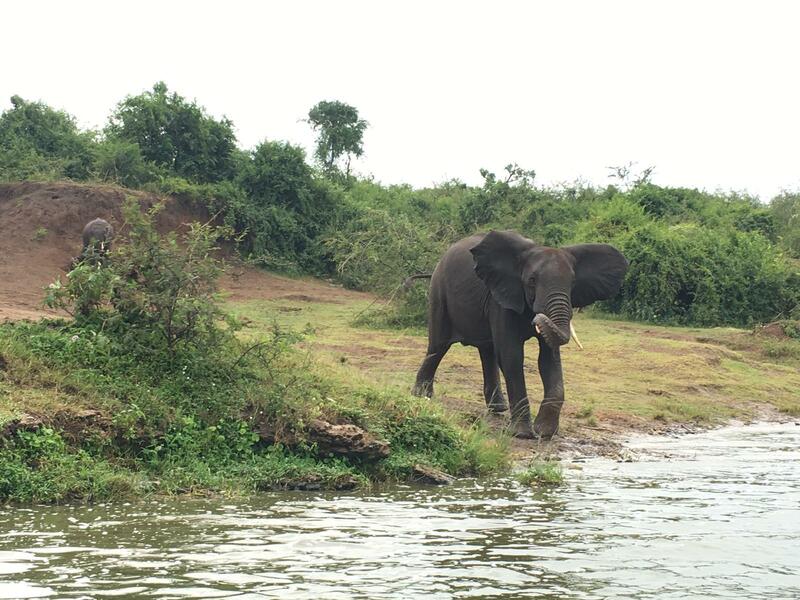 During the safari, visitors get good opportunities of viewing wildlife both near and far from the road, on water bodies and around the residential communities of lake Katwe next to lake Edward. Kalinzu forest chimp tracking: Kalinzu is one rich forest that is located east on the route to and from queen Elizabeth national park. Home to chimps and other primates, the forest also has rich populations of birds, butterflies, insects, and plant life. Due it its proximity, animals such as baboons, antelopes, elephants and others cross from queen Elizabeth to this forest. This forest offers affordable chimp tracking at 40$ per person and other four forest walks that visitors can participate in. chimp tracking is done two times a day; at 8:00am and 3:00pm. No prior booking is required, so guests have to just arrive 30 minutes before the trekking time. Kyambura gorge chimp tracking: Offering both forest walks and chimp tracking experience, Kyambura is in good blend with queen Elizabeth nations park. The gorge is 100m deep and 1km across with an underground forest that is home a small family of chimps. Bordering the park, other wildlife from queen Elizabeth visit the forest such as hippos, baboons, wild pigs, birds and others. The treks in this forest can be well arranged in the visitor information center at Mweya or at fig tree ranges camp. It can be easily accessed by road using public or private transport. the trek requires paying park entrance fees outside the chimp trekking fees of 50$ per person. Community accommodations: Staying in the community accommodation cuts the accommodation prices by over 50%. Besides, you don’t pay park entrance fees when you stay but only when you enter in the park. This can enable you to stay longer and cheaper. The room types range from self-contained rooms, none self-contained rooms, camping grounds and homestays where guests stay with the host families. Everything outside the park in the communities can be allot cheaper basing on your living style, since you shop from the same markets as the locals. Communities around queen Elizabeth national parks offer lodges, guest houses and homestays to select from basing on travelers’ interest. Shared safaris: This gives us the last best option of doing the safari cheaply. Arrive by public means, to the lodge located outside the park and share the scheduled wildlife safari. This way, you will not pay the high costs of private transport, you will pay the park fees only for the day inside the park and you will share the overhead costs with the rest of the team members. The higher the number of people to go on safari, the lower share you will pay on the overheads. We have suggestions of lodges outside the park that are most accessible by public transport. we will put you in lodges that rank the highest in service and yet charge the lowest prices. On request, we will guide you on how to travel from anywhere around Uganda to queen Elizabeth national park. All inquiries about the park activities can be directed to either your tour agent or Uganda wildlife authority through their Kampala head office or through the visitor information center in the park or through this website. All community activity enquiries can be exclusively directed to us though the website. Please contact us to find out the validity and availability on any of these activities or to arrange your accommodation at pocket friendly prices with friendly hosts and get greatest value for money.